EtherNet/IP runs on standard Ethernet hardware and uses both TCP/IP and UDP/IP for data transfer. 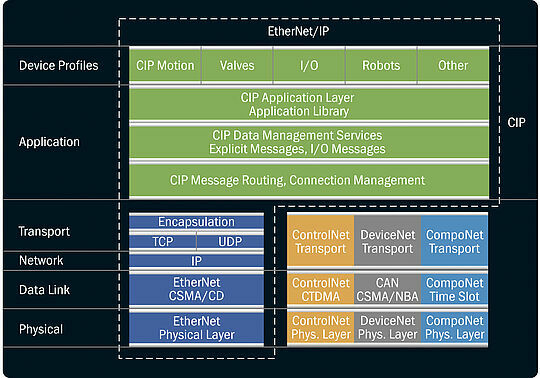 Due to the producer/consumer functionality supported by the CIP protocol, EtherNet/IP has various communication mechanisms at its disposal, e.g. cyclic polling, time or event triggers, multicast or simple point-to-point connections. 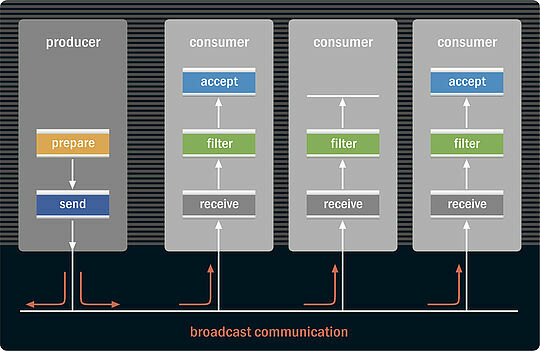 The CIP application protocol differentiates between “implicit” I/O messages and “explicit” query/reply telegrams for configuration and data acquisition. While explicit messages are embedded into TCP frames, real-time application data is sent via UDP due to the latter protocol‘s more compact format and smaller overhead. Forming the center of a star topology network, switches prevent collisions of data from devices that are connected using point-to-point connections. EtherNet/IP typically achieves soft real-time performance with cycle times around 10 milliseconds. CIP Sync and CIP Motion as well as precise node synchronization via distributed clocks as specified in the IEEE 1588 standard are used to approach cycle times and jitter values low enough to enable servo motor control.